I know you want to punch these guys in the face...it's OK. We all do. The most foul-mouthed blood bath you will ever witness. All that pent up sexual frustration spews out on the court like the fat kid on “Stand By Me”. 1 star. Oh Church basketball...how do I hate thee? Let me count the ways: "Over-the-hill dude who played high school basketball re-living the old days" guy? "I have 24 fouls, and I'm going to use them all" guy? "Copious amounts of back-sweat and back-hair and refuse to wear a shirt" guy? How about "Player-coach yell at everybody" guy? And then their families come to watch? It's like the hunger games. I cannot endorse this worthless past-time. Church basketball doesn't even pass muster on Rule #1 of the court -- No bald basketball players. 0 stars. Reenacting the crusades since 1954. 0 stars. 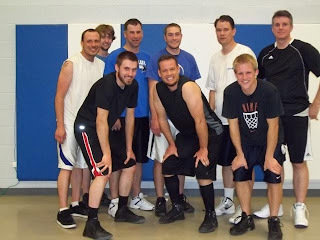 We're going to "round down" here...and give Church basketball a zero star rating.